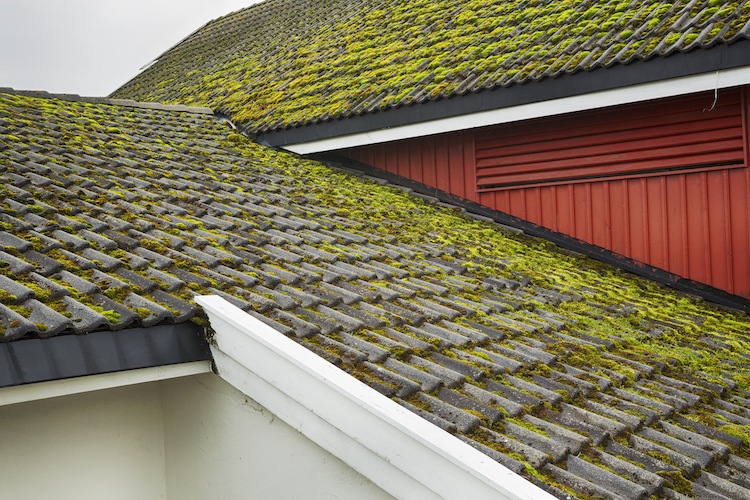 Yes, moss can damage the structural integrity of your roof. As a matter of fact, moss that is left to fester can lift up your shingles and cause leaks and holes. We like to call moss a roof’s nemesis because left on a roof, moss will lead to the deterioration and downfall of your roof. Did you know that constant moisture on a roof leads to bacteria and mold growth? It’s true. What’s more, moss thrives in damp and shaded environments. So, it should come as no surprise that many homes inside King and Snohomish County are plagued by roof moss, especially after the long-wet winter we just had. If you have a moss problem on your home, don’t despair. Instead, take control of the problem and make steps to rectify the situation. Here’s what to do and what not do to when treating your rooftop for moss. Don’t use a pressure washer to remove moss from your roof. This method removes the granules meant to protect your roof from UV ray exposure and can cause shingles to break off. Don’t use bleach to remove or kill moss on your roof. Bleach will kill the moss, but it’s extremely corrosive. Using bleach will damage vegetation and can badly discolor your roof. Remove loose or dead moss from the roof using non-abrasive hand tools and air. This preserves the granules meant to protect your roof from UV ray exposure and prevents shingle breakage. Assure the moss is completely gone. This can take 2-3 visits depending upon the severity of the moss growth. • Trim tree branches from the roof to prevent future moss growth. • Keep your roof free of debris like leaves and sticks. • Keep your gutters free of leaves and other gunk. Since Spring is the ideal time to get a handle on moss problems, don’t wait to tackle yours. At Pacific Pride Roofing, we’ve been solving the rooftop moss problem for local customers since 1989. Give us a call today, and we’ll have one of our experienced roof technicians scheduled immediately. Contact Pacific Pride Roofing Now. Moss-maintenance special offer includes treatment and disposal of moss. Residential clients only. Please Note: roof pitch must be under 6/12 pitch and less than 25 squares. Make sure to mention “Spring Special Offer” when making your appointment in order to claim the special price of $399 + tax. Some roofs may require a 2nd treatment. Pacific Pride Roofing does not force moss from roofs. We employ a gentle cleaning process using hand tools and only remove moss that is already loose. Most of the time our treatment kills moss and then, the remaining moss will naturally weather from roofs in 3 to 4 weeks. If this does not happen, we can hand remove the remaining loose moss and apply another treatment. Don’t miss this special spring offer! Fill out the form to the right or call us now at 425.252.0444!